Steady states to this generalized TASEP? We have a one-dimensional lattice of length $n$ populated with particles($p_1,p_2,p_3$ in this case) that hop to the right, but only if the neighboring cell contains no particle($p_1$ may hop, but $p_2$ may not). 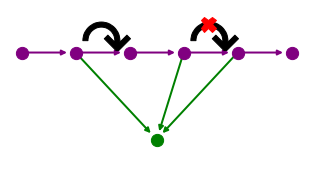 Each particle independently waits a random amount of (continuous-)time before trying to hop. Particles are injected into the lattice at rate $r_i$ as long as the first cell is empty and ejected from the lattice at rate $r_e$ as long as the last cell is full. Now we generalize our TASEP by treating our "lattice" exactly as if it was just made up of particles all along. We allow any edge to hop independently. If an edge has multiple possible hops, it chooses one at random. 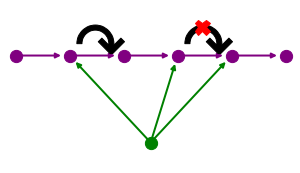 We allow any edge to be added to the graph between any two nodes at rate $r_i$ (if no edge exists between those two nodes) and any edge to be deleted from the graph at rate $r_e$ (if the edge exists between two random nodes) all while the edges independently head-move or tail-move. Given a random directed graph on $n$ nodes, what are the steady states of this process as we vary $r_i$ and $r_e$? What's the hitting time of these states? 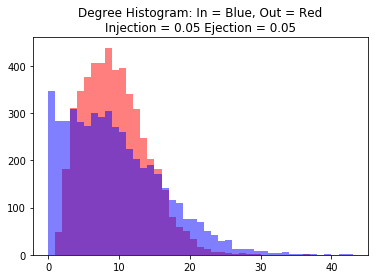 For large $n$ and as time $\rightarrow \infty$, what's the expected degree distribution(example below)? Besides the degree distribution, what other measures of the resultant graphs differ significantly from random graphs? #Return a list of all possible head moves for the edge (source, target1). #Return a list of all possible tail moves for the edge (source, target1). #Return a list of all available moves for the edge (source, target1). #Build our digraph. Note we don't mind self-loops! if G.size()>0:                               #Check if there are edges. random_edge=choice(list(G.edges()))      #Pick an edge at random. if len(move_list)>0:                     #Check if edge has moves. random_move=choice(move_list)         #Make a random move. Browse other questions tagged probability-distributions stochastic-processes markov-process random-graphs or ask your own question. Examples of Non-Markov process with continuous time and finite set of states. What is the statistical steady state of this poisson process? What are the measures, methods, and strategies for analyzing dynamical graphs?